The snow was falling thickly outside my office window all day. A curtain of white had been pulled over my usual view of downtown Manhattan—the Freedom Tower, the ferries on the Hudson River, and the Statue of Liberty—so that only a stately water tower a few blocks away was visible in the blue-gray air. Here on the 15th floor, it looked as if it was snowing up, the flakes swirling in circles. Around mid-afternoon, the emails started, suggesting that we head for home. I looked at the MTA website and it warned that the storm was getting worse; commuters should aim to finish travel by early evening. 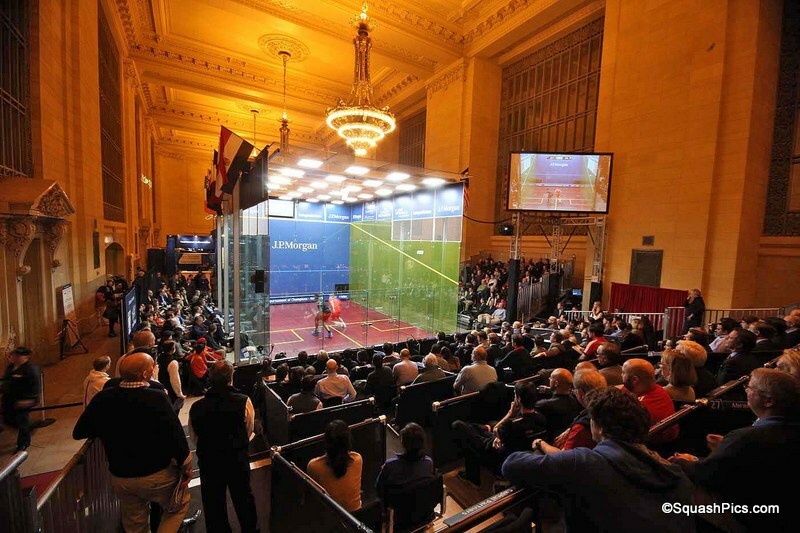 So I did what any squash lover would do at this time of year in NYC, I got on the train and headed to Grand Central and the J.P. Morgan Tournament of Champions. I’d missed the first weekend of my favorite pro tournament of the year due to a cross-country ski trip, so I wasn’t about to miss more of it due to a few little flakes. Tonight had been unofficially deemed ‘ladies night’ by a friend and fellow lady, so I arrived at the ToC bar by 5:30, bought a Palm beer, pulled up to a table, and settled in to watch the first women’s match of the evening: Latasha Khan (World #32, USA) vs. Low Wee Wern (#6, MAS). I’d seen both play before and my money was on Low. She’s quick, accurate, and more than a few years younger than Khan. Experience definitely counts for something, but Low has racked up some of that, as well. Khan fights well and hard, but Low had forced her deep a number of times, throwing Khan’s timing off just enough off that instead of shooting the ball back along the left wall, it caught the corner and flew more lackadaisically into the center where Low could put it any number of places, many of which Khan couldn’t get to in time. Khan made Low work all over the court, but Low had the skills from training and the energy of youth to take Khan down in three clear-cut games. The bar, which was coffee-shop quiet when I got there, was crowded and buzzing with more than caffeine by the end of the women’s match. And when Amr Shabana (World #8, EGY) and Nick Matthew (#1, ENG) took the court to warm up for their quarter final match, the din went up a notch. The boom-boom of the bass in the music the ToC plays between matches grew louder. The treble notes of chattering voices rose. Plates clattered in the players’ and sponsors’ lounge. Late-arriving ticket holders grabbed drinks and headed to the stands. 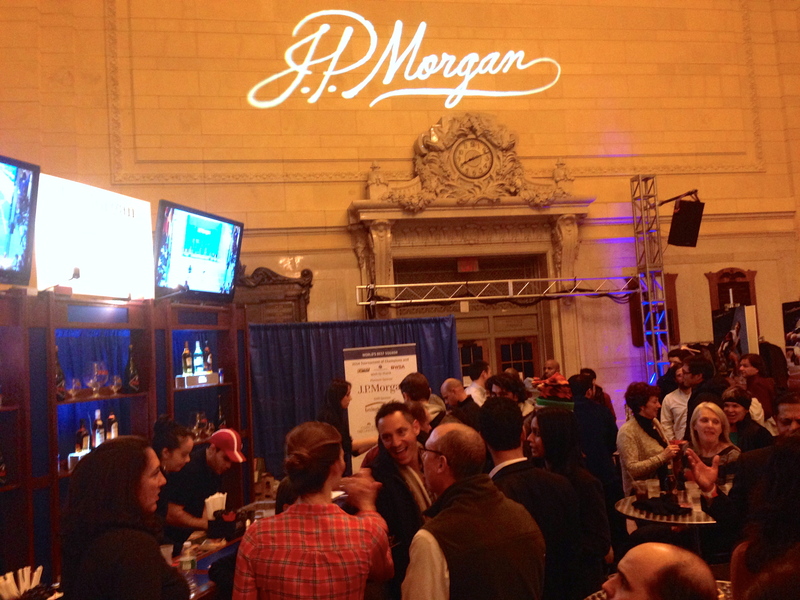 The bar area seemed mostly made up of working joes and janes of the league level world. My people. But the din became muffled once play began and we jostled for a good sight line to the large screens above the bar. It still seems a bit odd to watch the action on screen, when you can hear the back wall being hit just a few hundred feet away, but there’s no need to stand on your toes and crane your neck, as there is at the free space behind the front wall. My money this time was on Shabana. Not that I felt confident of a pay-out, but I’ve always liked his down-to-earth everyman look—more Cary Grant to Matthew’s James Dean, more Christian Bale than Bradley Cooper. Then again, the guy’s Egyptian, so what do I know? In any case, they’re all tremendously talented; it’s more the style you go for. And given the cheers, it was clear that it was more than me who went for Shabana. A friend commented before the match, if Shabana wins the first game, he’ll win the match. But he didn’t win the first game. He did, however, come close. After a sharp start by Matthew, using his signature accuracy and athleticism, he dominated the first game, and Shabana seemed asleep by comparison. But maybe he just needed more time to warm up, because he came back to tie it up at 8-8, then 9-9, and just a little over-eagerness cost him a few tins and the first game, 11-9. The late come-back seemed to give Shabana more confidence and outweigh the loss. Despite Matthew’s excellent accuracy and patience, Shabana kept pushing. Down 3-6, he showed Matthew a shot then executed another, as if a magician, and Matthew fell for it. It was a showy shot everyone loved, but not one he was about to repeat. Matthew tinned to lose the next two points, letting Shabana tie the score up again at 6-6 and keep it tied until 10 all when he pushed to win the next point and then won the game 12-10 by a tin from Matthew. One all. Shabana was in control at the beginning of the third game. He matched Matthew’s steadiness, but Mathew’s usual accuracy seemed shaken and Shabana took full advantage, sending Matthew all over the court and forcing some errors. It was a taste of Matthew’s own medicine. While Matthew dug back in to even it back up at 7-7, that was as far as he could get in this game and Shabana won 11-7. Now it was 2-1 is games for Shabana. We were all a little giddy at this point at my table, so the first few points of the fourth game went by before we could look up from our plastic glasses of beer. When we re-focused, Matthew was on a rampage, and understandably so. He’s World Number One. WTF! Before we knew what hit us—or Shabana—he was down….a lot. And then a lot a lot. And then it was clear that he was giving this game up. It’s not exactly manly in my book, but I get the strategy. Game Five is why I came to watch squash on a snowy night…and didn’t follow all the saner signs to head for the homey toastiness of my Brooklyn abode. A home-cooked meal after a weekend away was particularly tempting, but episode three of Downton Abbey could wait another night. Its soggy plotlines couldn’t compare to the edge-of-your-seat mystery playing before me. Shabana started strong and focused with a beautiful nick and then gorgeous cross court for the first two points, but Matthew countered with his own maneuvers and he was careful not to show his fatigue. Shabana, on the other hand, clearly looked like this was his fifth and final game. The two traded leads all the way to 7-7- and then Matthew tinned to lose the next two points in a very un-Matthew way and suddenly Shabana was only two points away from a major upset. With his fatigue wiped away, he confidently dropped to the right corner and he was now one point away. 10-7. Match point. “This is huge,” a friend exclaimed. It was and it wasn’t. It was one little point. And Matthew got the next one And then the next one was clearly a stroke for Matthew, followed by a sustained let. 10-9. Matthew went for an overhead volley. The ball dropped. Into the tin. Shabana leapt into the air and up the front wall of the court. A human squash spider. It was Shabana’s night. And by his smile and friendly hug, Matthew seemed all right with that. For now. And for now, that’s all the squash I could take. 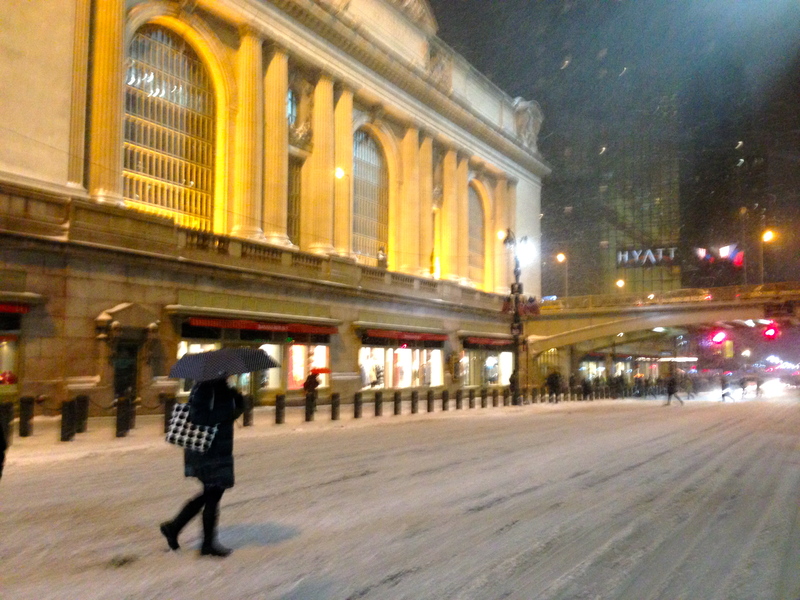 I was glad to walk back into the snow and ride the train home. Great post, Tracy. I wish I could have shared that beer with you… and the match! I felt as if I was right there watching, in suspense until your last word revealing the outcome. Great job! And, really, I only had one beer…. Soggy plotlines!! ;-). What is to become of Anna and Mr. B….? Here’s a question, who would make the best squash players at Downton? 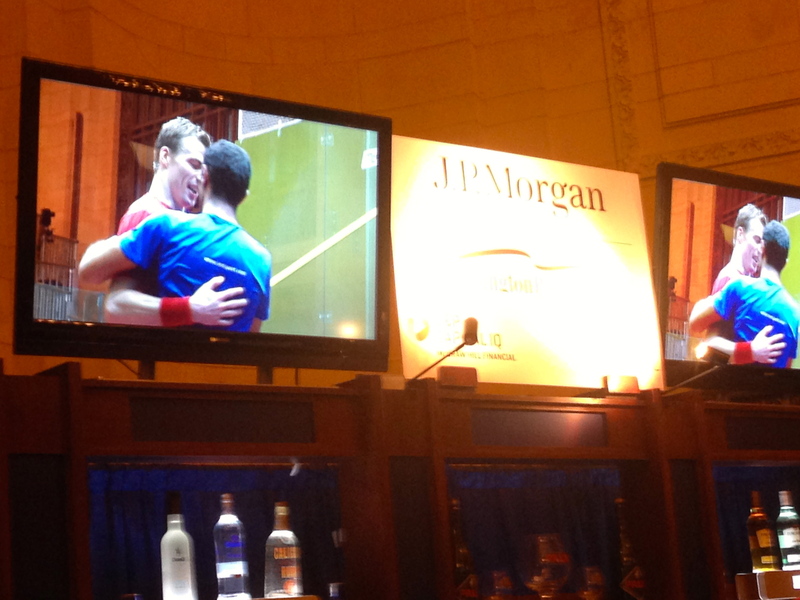 A good on-court battle or two might help with the tension…! Great post, Tracy, and glad I made it uptown, too, despite the siren call of my couch and the Australian Open. Fun to see everyone, especially on a snowy night. By the way, I heard that Mr. B plays squash in real life (I think at Ivy’s club in North London). I’m two episodes behind with Downton and probably won’t catch up until after the ToC and tennis down under are over. Exciting matches all around! Thanks, Syn 🙂 It may be because you recognized a few landmarks in your hometown….but are glad you live in sunny southern California! Great story, Tracy, and thanks for the news (the only news!) on Latasha Khan’s match. She’s a local favorite here in Seattle, and a great person by the way. I watched the match on a screen as well, loved it (the match), and was greatly entertained by Joey Barrington’s commentary. He’s hilarious. Thanks, David. We like Latasha here, as well. She makes us forty-year-olds feel that there’s still hope! I’m in awe of her fitness and holding her own with the kids. I have to listen to my own voice if I want to write anything, but Barrington is indeed entertaining.